The Fields of Bear Mead, and those surrounding, as they were in the early 1800's and at the start of the 21st Century. The History of the A31 road. Chaw Meadow in 1786. 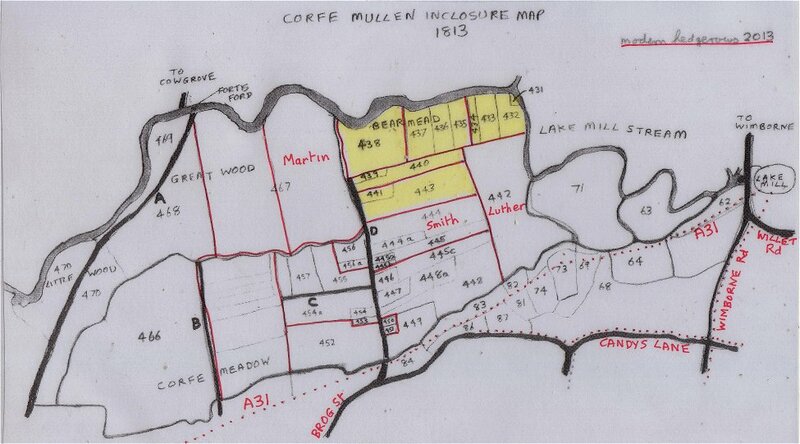 Corfe Mullen in 1809. 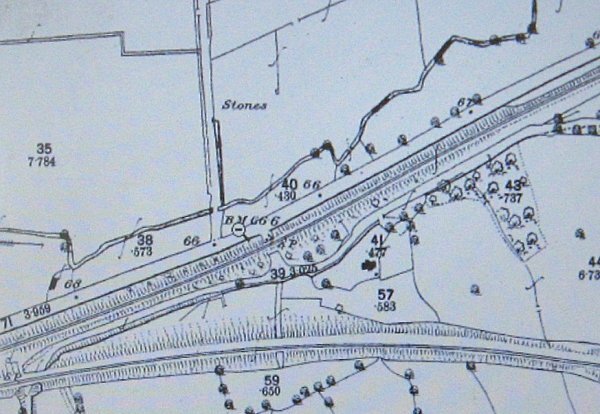 Note how, about 1847, Candy's Lane near Field 86 was moved slightly South to leave enough room for the railway line plus embankment. O.S. map surveyed before 1888. Single-track railway (1847) runs tight between turnpike (1840) and Brog St. Flood plains prone to flooding around Bear Mead. Up to 800 metres South and 1000 metres North of river. Scale 15,000:1. Dark blue: 1 in 100 chance of flooding each year. Light blue: 1 in 1,000 chance. This Trust, set up by Act of 1840 (3,4 Vict c xxiii) was the last of the ordinary Dorset trusts but one of the most important and interesting Important because it led indiectly to many far reaching changes in the road pattern of the part of the country it concerned; and intersting because, thanks to the existence of clear and detailed plans it is possible to see just what changes were intended and how they were made. .... it resulted in considerable loss to its chief promotor, the then owner of Charborough and Member of Parliament for Wareham, Mr John Samuel Wanley Sawbridge Erle-Drax. This was because it came too late, for within less than seven years of its completion the railway from Wimborne to Dorchester through Wareham had taken away much of its purpose. (1) From Wimborne to join the Blandford and Poole turnpike at Corfe Mullen. This is the road from Wimborne over Julian's Bridge to the church at Corfe Mullen. On the town side of the bridge the road took a new line slightly south of the old: west of the bridge, as far as the turning to Lake Farm it was a new version of an old road called Netherwood Lane, which had already been widened some thirty years before; and the mile and a half west again was a new road. 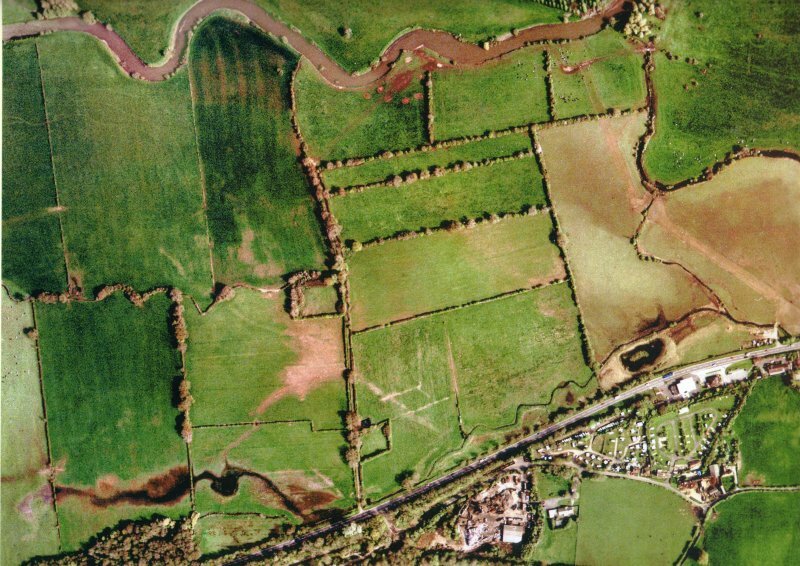 A remarkable feature of the plans for this turnpike is that they include the road from Newton Marsh (Stag Gate) through Sturminster Marshall to White mill Bridge and thence all the way by the Cowgrove road to Wimborne. This was not in the end included in the Act but the straightness of the road between Stag Gate and Sturminster Marshall may date from this time. 441   Wm BEAMINSTER          Henry JENKINS       Corfe Mead       Meadow   00-3-33 "part of Field 5"
443   George WESTON          Ann WAREHAM         Corfe Mead       Meadow   05-2-01 "part of Field 5"
future owners of the said Allotment for the time being. 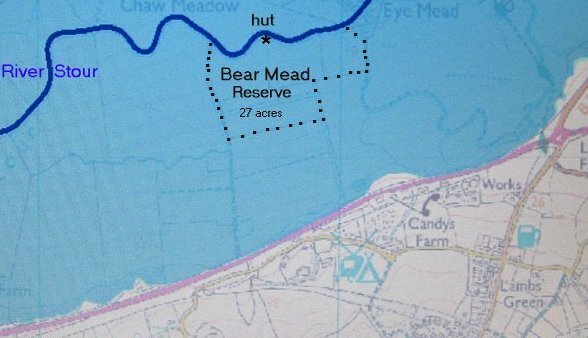 [Chaw Meadow lies directly across the river from Bear Mead. Hain = to save, preserve, to spare (Scottish). To inclose for mowing; to set aside for grass. the 8th of June next, and to make their objections thereto. WM. DEAN, Clerk to the Commissioners. Witness my Hand, December 17, 1809.